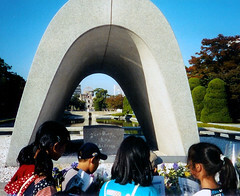 These photographs were taken at the Hiroshima Peace Memorial Park during my around-the-world journey in 2002. 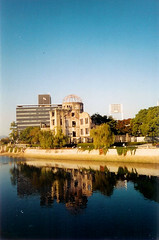 I have been thinking a lot about Hiroshima lately, having just completed Richard Rhodes’ The Making of the Atomic Bomb. This 800 book chronicles the scientific work and historical events that made the atomic bomb a reality. It begins with ideas and calculations on paper, moves to laboratory experiments; is interrupted and simultaneously stimulated by the rise of fascism and death in Europe; shifts to the New Mexican desert for more experiments; and ends with the instantaneous destruction of cities along with more than 100,000 human beings. Despite mountains of technical exposition and knowing how the story ends, the book reads like a John Grisham page-turner. There were some fascinating men and women at the center of the story. It is not exactly a summer beach book, but well worth a read. It is unfortunate that science cannot develop formulas which successfully predict human behavior in the same way it revealed the nature of the atom. I was sitting with my cup of coffee and bowl of instant oatmeal trying to think of something interesting to post when I remembered this photo of early morning Beijing. This street vender was serving the typical sidewalk breakfast of rice soup, noodles, and (my favorite) deep fried dough. 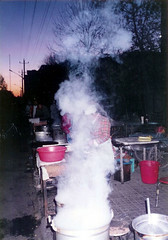 Street food is always available in most Chinese cities. In some places there is a designated “food street” where licensed vendors line up serving all manner of dishes. I have many fond memories of fried noodles, steamed dumplings as well as various “food on a stick.” As long as the vendors and their cart looked to be generally germ-free I was up to try almost anything if the mood hit me. The “Floating Shrine” of Itsukushima is located outside of Hiroshima, Japan on the island of Miyajima. 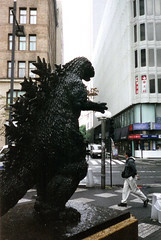 For some reason I didn’t record my visit to the island in the journal I kept during my 2002 trip to Japan. The thing I remember most about the island was the distinct lack of monkeys. Both my guidebook and local tourist brochures promised that there were rambunctious monkeys roaming freely on the island. Most of my previous experience with monkeys has been limited to visiting the zoo, so the idea of an entire island full of wild primates was exciting. I arrived on the island via ferry, visited the quiet town and beautiful shrine, and then hiked up the mountain to where the monkeys lived. I don’t remember how long it took me to climb the 530 meter Mt. Misen but it wasn’t easy. As I neared the summit I began to see signs illustrating the rules and regulations when dealing with the monkeys. One warned, “We do not like to be stared at our eyes. If you do so, we are not responsible for what will happen.” (Scroll down on this link to see photos of the signs.) Not only was I going to see some monkeys but potentially dangerous ones, I was excited. I put my bag into a locker as recommended by the park officials and then scouted around hoping to spot some monkeys. But alas, I didn’t see a single monkey. I don’t now if it was the wrong time of year or if all the monkeys were on their lunch break, but there were no monkeys to be found. As I hiked back down the mountain I felt like the victim of some sort of monkey conspiracy. “Oct 26, 2002. Sitting in my own personal capsule and rather enjoying it. Everything is provided in some form or another: lockers, showers, robe, slippers, even a toothbrush with pre-applied toothpaste.